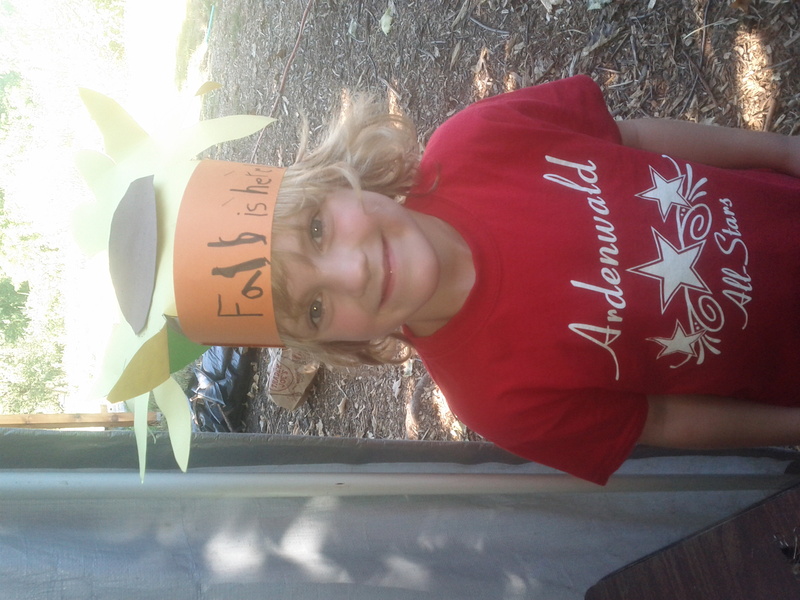 Ellie with Special sunflower hat first day of fall! Okay . . and here’s the box! 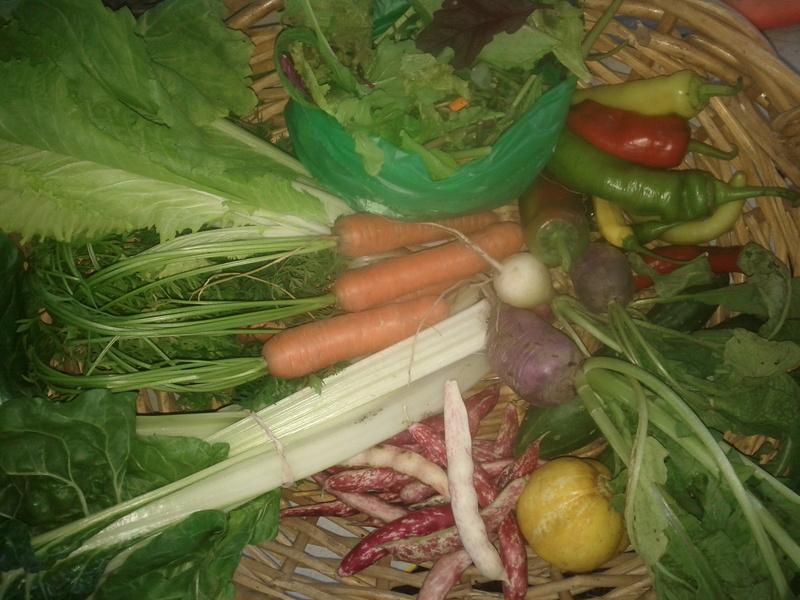 Pac Choi or Chinese Cabbage Michili – Last week featured the Michili, we gave either or as they are similar and there wasn’t enough pac choi planted for all the boxes. Great raw, sautee, pickled, or fermented! Cucumbers – Probably the last! Sweet Pepper – Sweet banana, jimmy nardello, carmen and various italian sweets. Hot Peppers – You can identify these by smaller size and in this weeks box you got czech black, like a jalapeno or lemon drop, which is even smaller and a bit krinkly green or yellow. Very hot with an amazing pineapple essence! Basil – I didn’t double check the list before some were delivered and only half of the boxes got the basil. Sorry! Hopefully , next week there will be more. Shell the handful of beans. Boil for 10-15 minutes in salted water until tender. Drain. Mix in a quarter of a lemon, olive oil , and basil. Serve warm or chilled. Happy Fall equinox! Each day we marvel at the lighting. We admire how the light hits the crops with a softer and sharper touch. Morning time starts with a sweater and after a few hours we’re in tank tops. It’s been lovely to experience life these days. 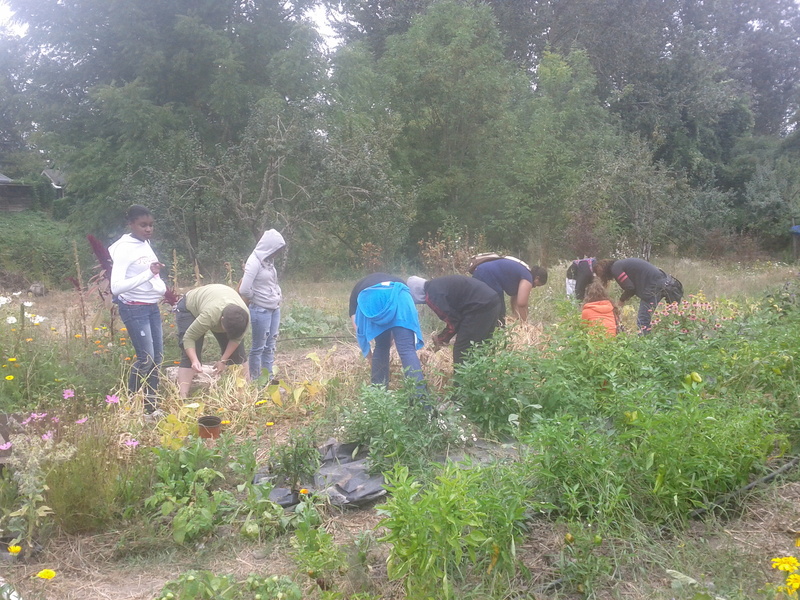 Harvest and fall crop planting and tending have lured us into lots of energy directed that way. It’s been satisfying to collect and thresh seeds; feeling the completion of a full cycle. 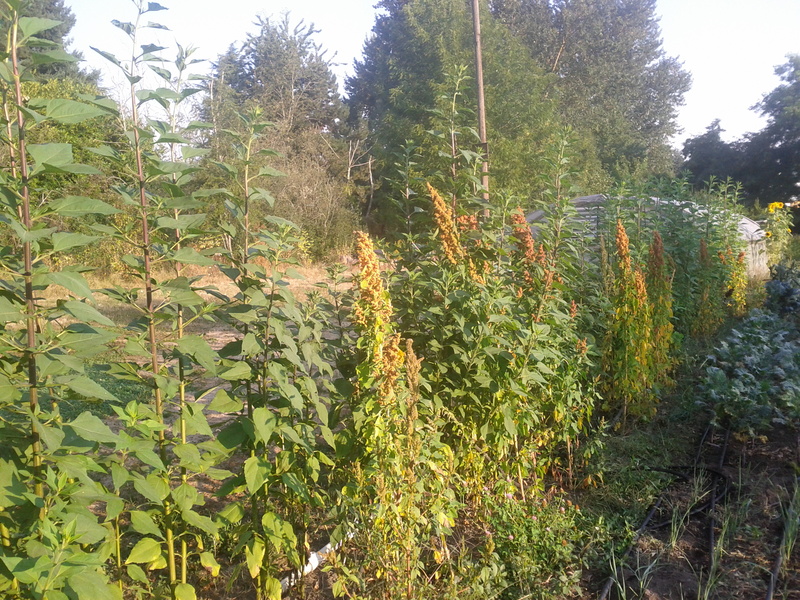 One of the two tiny patches of quinoa was picked, dried a few days in the sun and will be put aside to figure out how to thresh/clean further on. If anyone has low-tech ideas about cleaning seeds let us know! We’ve had lots of help and support from volunteers lately. We are preserving something most days too, quite fun and exploratory. For example we now know how cucumbers dry–alright but not worth it. 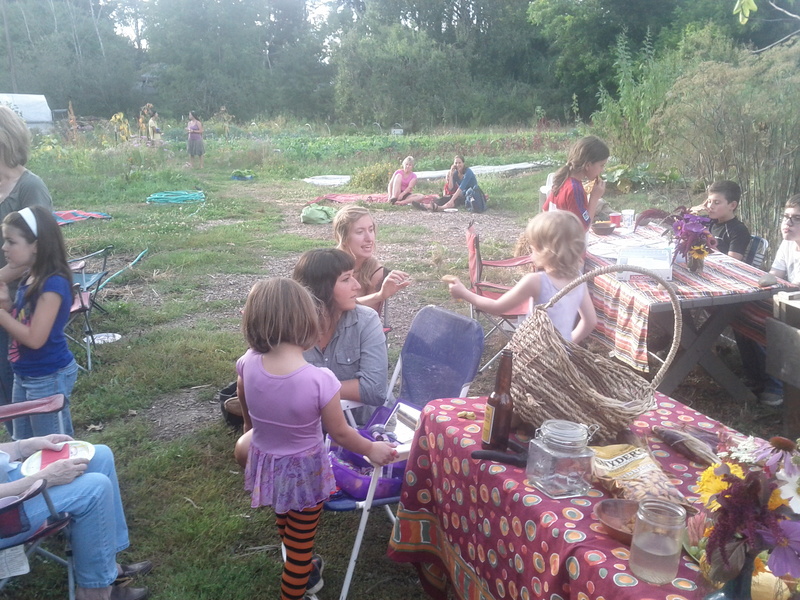 It would be awesome to see you at out the farm party this saturday! 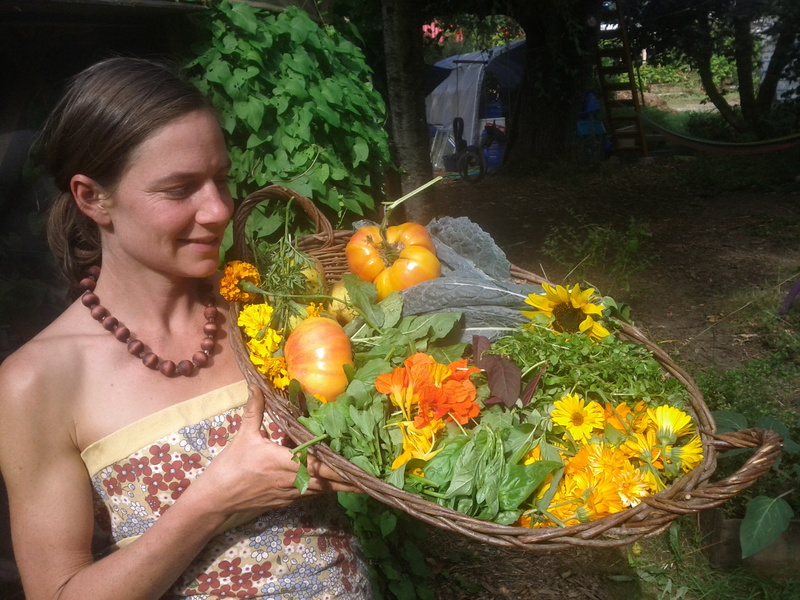 Salad Mix – lettuce, young brassicas, wildpurslane and calendula petals. yummmm!! lots of olive oil is really wow. Michili cabbage – the large cylindral light green head is a mild chinese green delicious in stir fries, pickled, or raw. I would lightly massage the leaves if eating raw because they’re a bit fuzzy. It’s so fresh tasting! I planted twice as many per square foot this year because they were enourmous. I like the size they are today. Radish – Some are a bit spicy from the heat! Remembering you canh eat the greens too. Easter egg, plum, and white icicle varieties. Tomato – Slowing down, maybe 3 more weeks? Cukes – A few small ones unlike previous weeks bounty as they’re slowing a lot with the powdering mildew. Garlic – 2 heads of mostly Spanish Roja varietal. Place the shredded bok choy, cucumber, carrots, and cherry peppers into a large salad bowl. Place the jalapeno peppers into the work bowl of a food processor, then pour in the apple cider vinegar, brown mustard, soy sauce, and agave syrup. Pulse several times, then process for a few seconds to combine. Pour the dressing over the vegetables and toss. Refrigerate from 1 hour to overnight. Before serving, sprinkle with roasted ginger and black pepper; toss again to serve. Mel a little crazy after lots of canning! 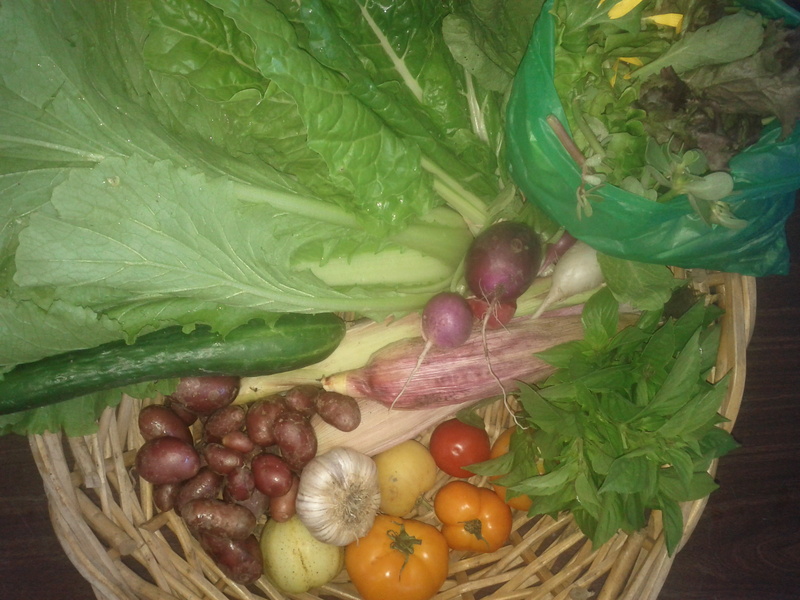 Salads and greens are making it back in the boxes in more quantity as the weather turns. 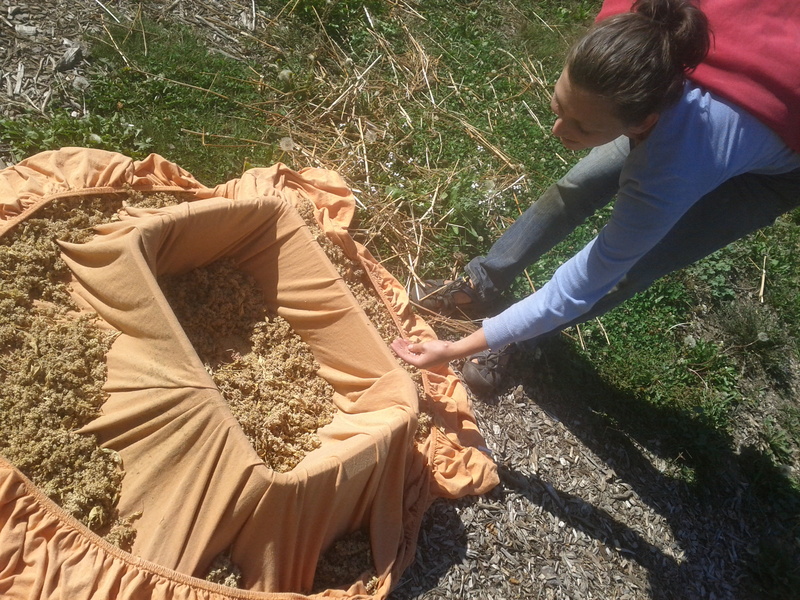 Clouds are back and we have been busy collecting seeds, getting the last fall/winter crops in and the some cover crop. We had 10, 14 year old girls out who pulled the dry soup beans and then had a big harvest day where we canned too! We put up 70 jars of tomato sauce, pickled cucumbers, green beans and carrots. It was a fun Thursday. Welcome two new members for the fall harvest: Mark, Midori, and Emily! recommended for high feeding corn. It was my first year growing it. Hot pepper – the smaller ones are hot. Turnip greens or Spicy Mustard – these are thinnings. Eat turnip greens like other greens. Sautee or raw chopped small and/or massage to take fuzziness away. In a large skillet or wok, melt butter over medium-high heat, and cook and stir cumin seed, chile pepper, garlic, and turmeric until fragrant, about 2 minutes. Stir in the chopped mustard greens and spinach a little at a time, adding the tougher parts first (the stems and thicker leaves). Continue to add greens, and cook and stir until all greens have been added and all are thoroughly wilted. Stir in the cumin, coriander, and salt. Cover; reduce heat and simmer until greens are tender, about 10 minutes, adding water as needed to keep the greens moist. 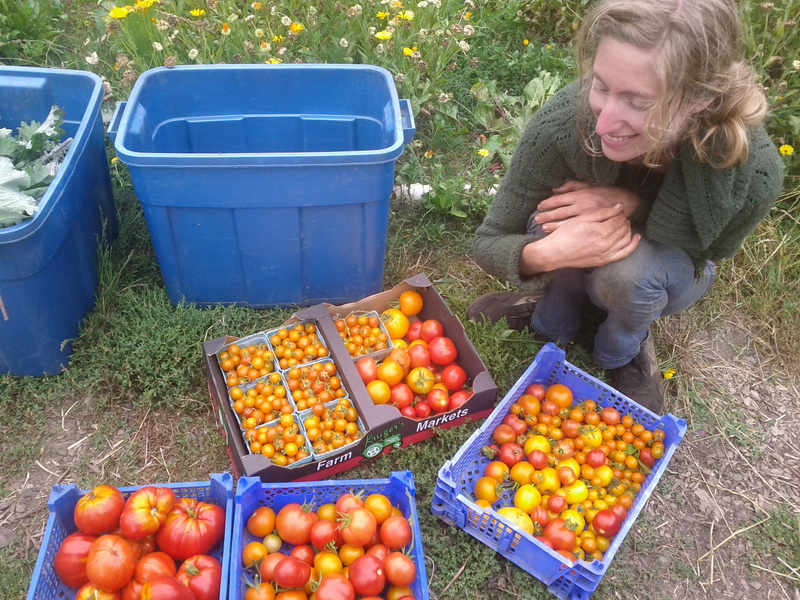 Tomatoes – lots and lots of them! 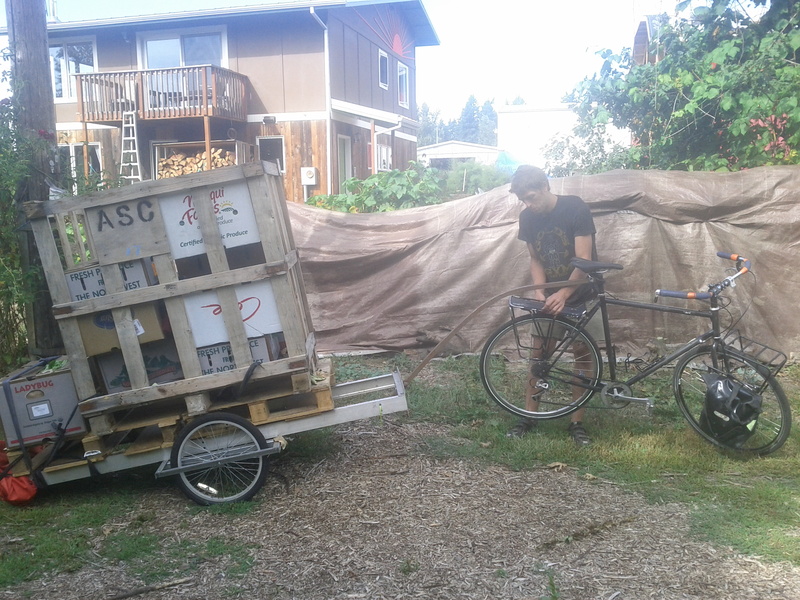 Eggplant – Farm pickup only, next week SE and Sellwood. Potato – Russets, nearer to new potatoes and not very starchy. 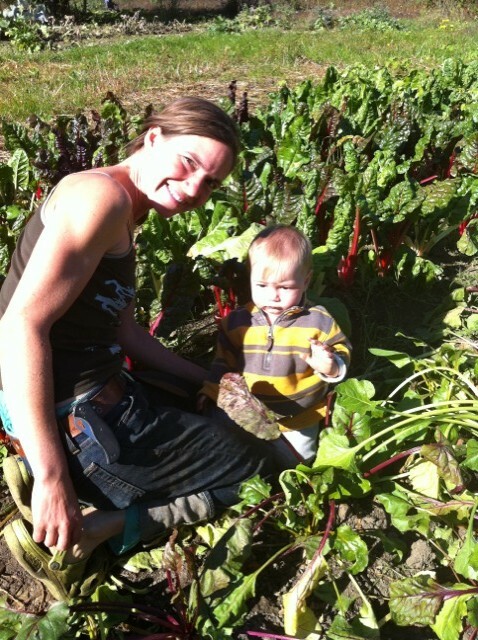 Baby baby beets in bunches – Great steamed and topped on salad. Squash – If you got an enormous one it’s great for the grill. Cut potatoes into 1/2 inch cubes, steam until half cooked. Sautee in high heat oil until soft. Then add cubed tomatoes and let them cook down a few minutes. Top with basil! Slice into 1/2 inch if a long zucchini. If round and large, quarter and then slice in 1/2 inch. Add salt. Place in hot high heat oil on cast iron pan or steel and cook about 7 minutes each side or until dark brown. They melt in your mouth! Chop up peaches, pears, apples and whatever other fruits that are in season. Top with finely cut pieces of cinnamon basil. In a saucepan, melt chocolate with 1/4 cup sugar and 1/4 cup hot water, stirring until smooth. Beat egg yolks and stir into chocolate. Remove saucepan from heat. Beat egg whites, gradually adding remaining 1/4 cup sugar, until peaks form. Fold egg whites into chocolate. Fold 1 1/4 cups cinnamon basil whipped cream into chocolate. Pour mixture into ramekins or glasses and chill for 3 hours. Top with remaining whipped cream and serve. A few mornings ago I woke up and didn’t want to get out of bed because it was chilly. I thought it must be because I was so tired, but indeed the temperature was 45 degrees. 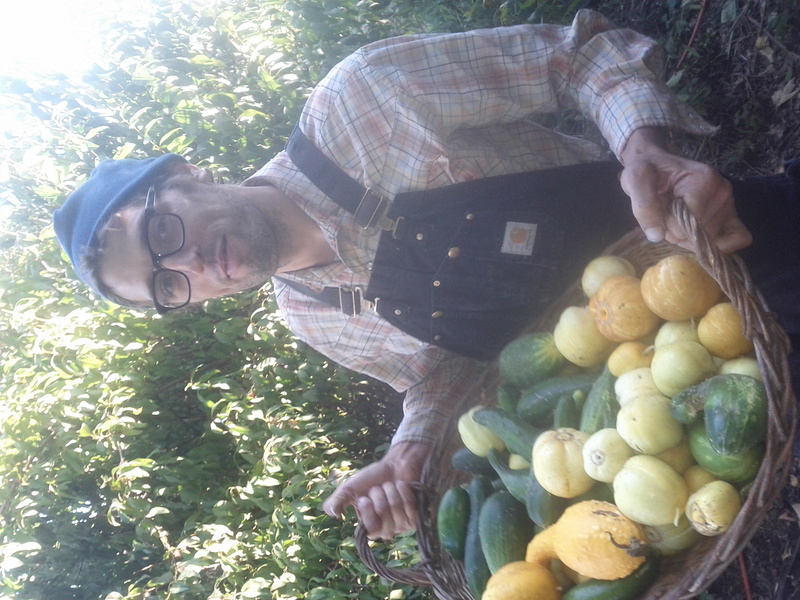 As I picked some things in the morning, the dew was so thick it dampened my pants, and fall’s arrival felt so close. 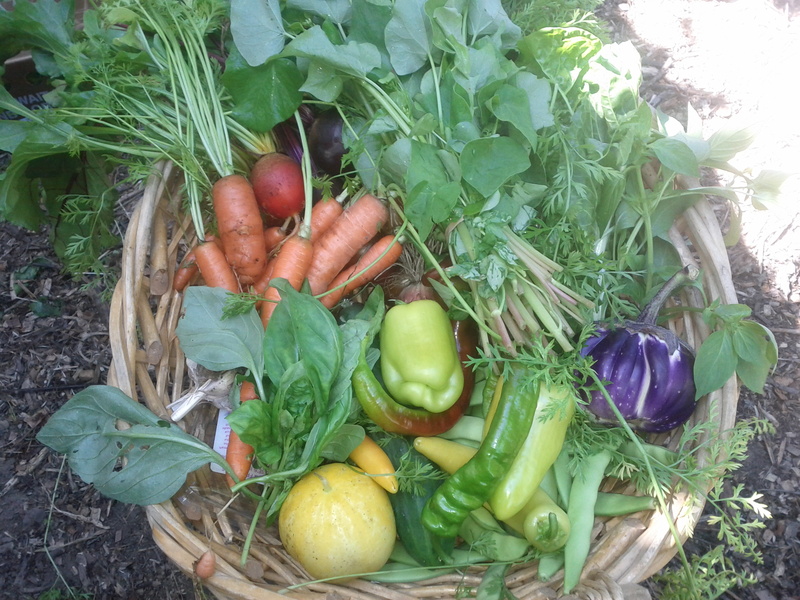 I love this time of year in the garden, when harvest is heavy with summer crops and fall greens and roots are popping out of the ground and filling the beds with a sea of deep greens and the earth is dark from watering the young plants. Days are busy and hectic and there is a bit of relief as the sun goes down earlier and sleep is a little longer. It’s a beautiful time. 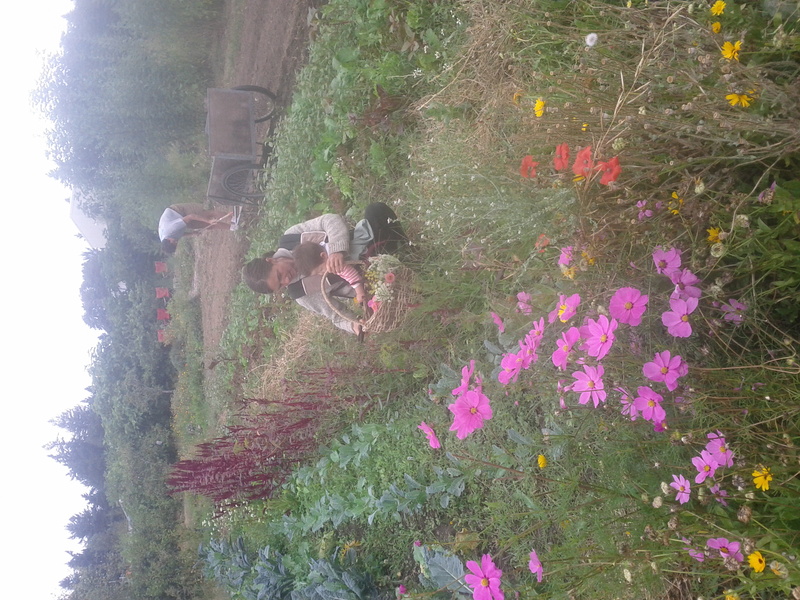 In the field we’ve been weeding new crops and harvesting. 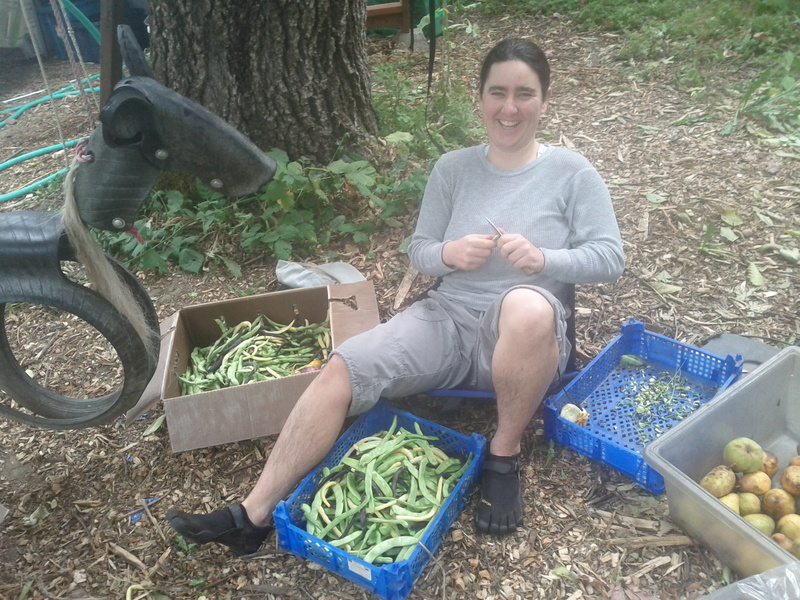 Today we’ll harvest all of the storage onions and some soup/dry beans. A few other beds will be cleared to get ready for fall/winter cover crops. This week we crossed over into the second half of the season, with 12 more weeks to go. 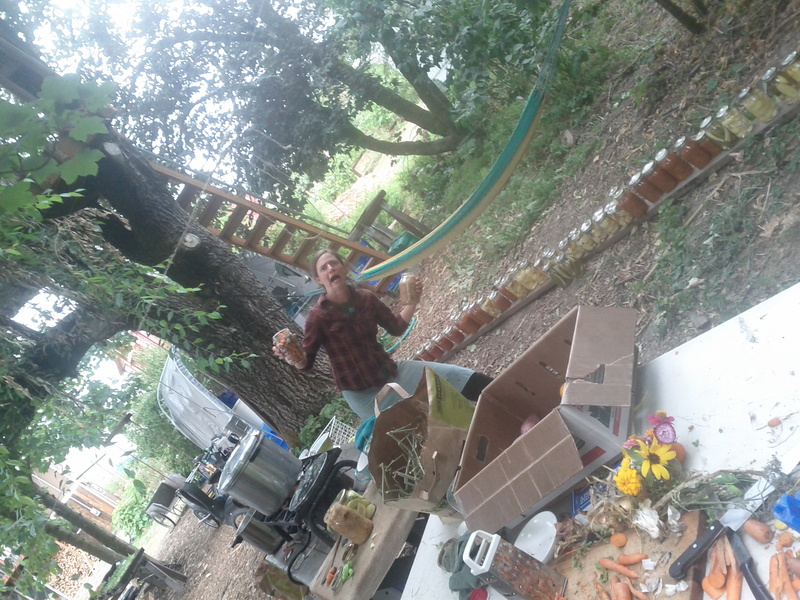 I hope you’re ready for lots more veggies:) Be on the lookout for a potluck/open house/workparty invitation in September. 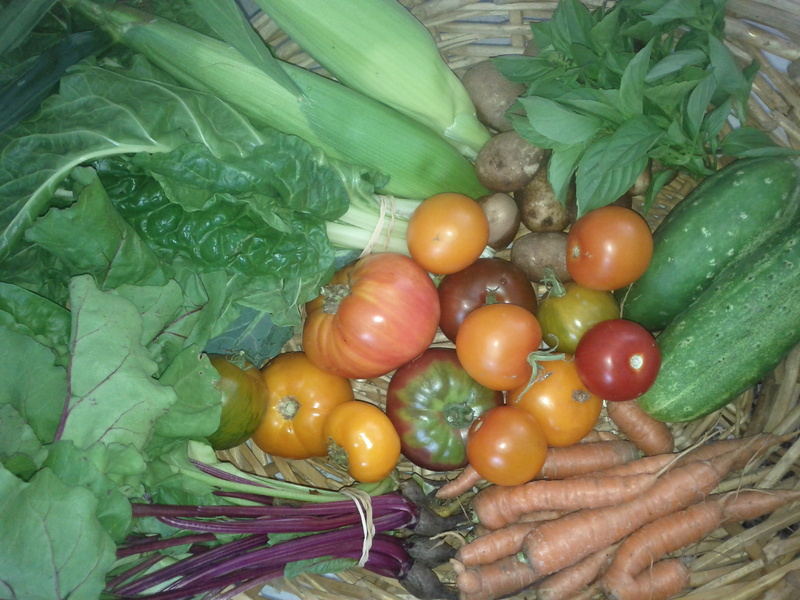 Box #14, tomatoes hidden by abundance of other freshness! Buckwheat Greens – I plant buckwheat as a summer cover crop. 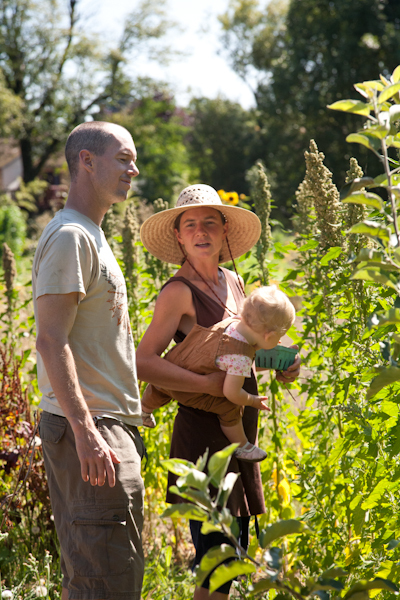 Many seeds that didn’t sprout earlier in the summer came up when watered with the fall crops. 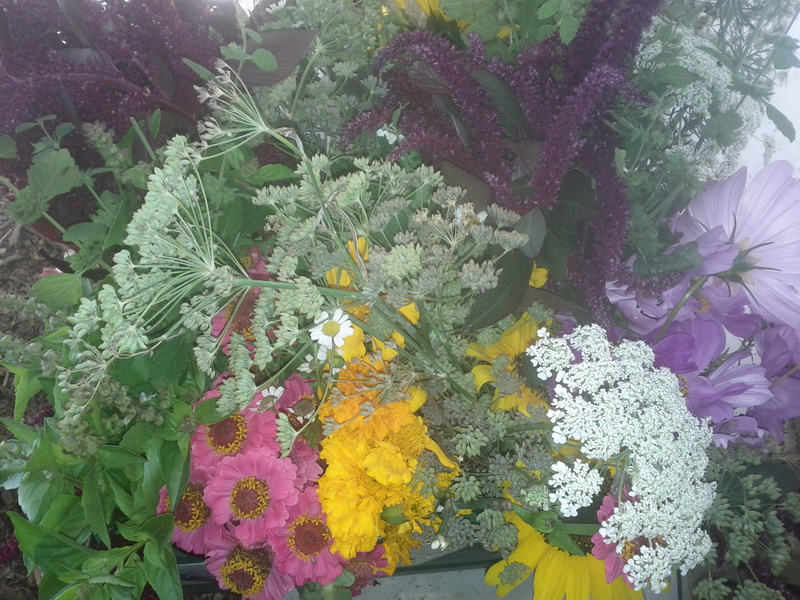 We weeded the plentiful buckwheat from the cabbage and radichhio row and bunched them up for you! In the buckwheat (polygonacea) family, the slight tang is similar to what you might have tasty in sorrel which is in the same family. Filled with antioxidants, it is super nutritious. It is grown as a microgreen commercially, but not to be eaten in large quantities. Split the salad with a friend and you should feel great. I ate four handfuls in the fields and loved it! Sweet Peppers – Jimmy Nardellos, carmen, sweet banana, lipstick, and little bells. 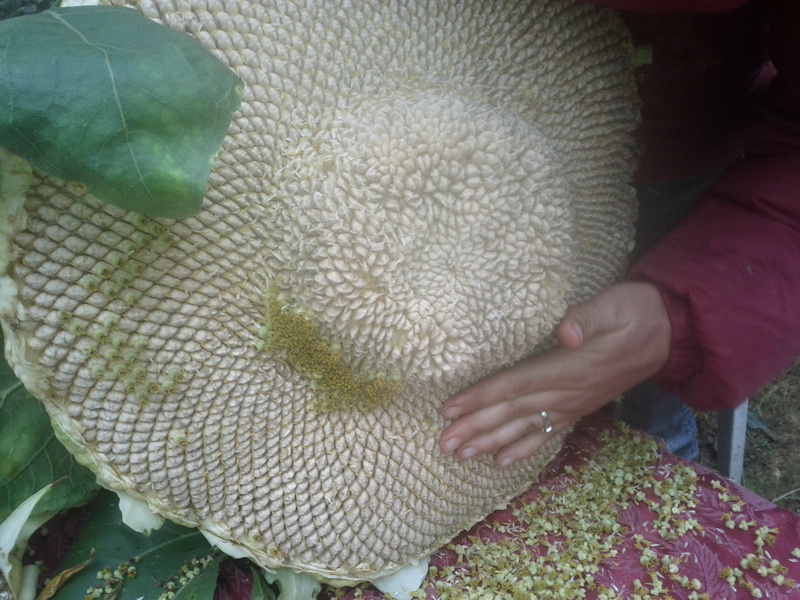 It was exciting to pick a larger harvest for you and this weekend’s heat should bring a lot more. 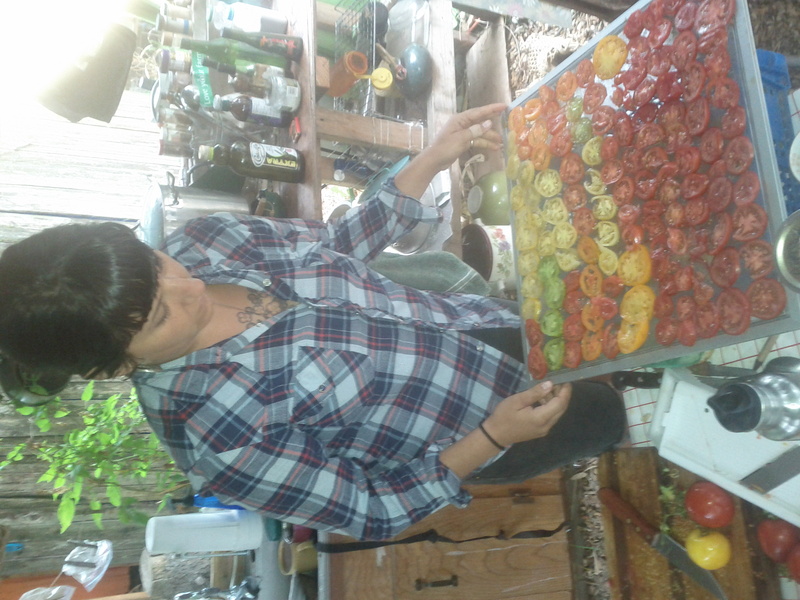 Tomatoes – About 3 pounds of several heirloom varieties including orange king, gold medal, black prince, SW native with unofficial name “apricot”, super lakota, italian heirloom. Some are large because they were pruned or it’s their nature and some are small similarly. I top almost every dish with diced tomatoes, delicious! Beets – This is the last pick from the first planting. In a few weeks the fall crop will have a fresh young harvest. Carrots – Yaya, scarlet nantes, and /or chantennay varietals. I like to grate on salad for color, taste and texture. Also pairs great with sauteed green beans. Basil – Lemon basil and regular basil. Toss greens with olive oil, black pepper and salt. Chop up greens and stem and saute for one minute on high heat. Top with salt. I had something very similar recently and it was delicious. The nutritional yeast really enhances the cheesy and creaminess…yummm! !